I have a question about an LM741 op amp IC. When the op amp output is low, the output voltage is still around 1.2v. Is this normal? Is it because the op amp can't output the full voltage swing in either state (low 0v or high 9v output) due to the op amp's non-ideal properties? Note, problem remains with load transistor removed from circuit. The LM741 is a terrible choice here – not only is it straight from the 1970s, but most importantly, it's not a rail-to-rail opamp – when you read its datasheet, you'll notice that the voltage swing is some 1.5 to 3 V away the positive and negative supply voltages. 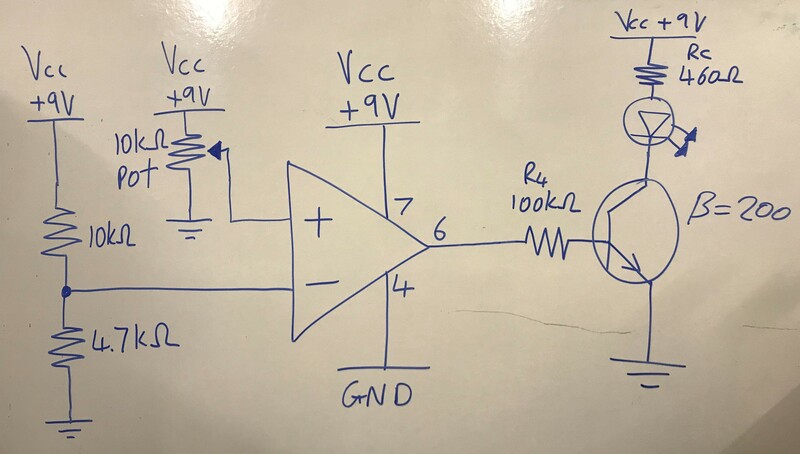 Besides from that, the TI datasheet for the LM741 recommends a dual supply of +- 10 V relative to ground – you're not even giving it half of that. So, it's no use using a LM741 in a single-supply design where you need the opamp's output to venture reliably below 1V. Get a better opamp. You're looking for something that has rail-to-rail properties, and a minimum supply voltage below your supply voltage. In fact, 9V is a rather uncommon voltage, and maybe a much lower V_cc,min opamp will make your life easier? I'd recommend perusing TI.com's product tables. There's so much better stuff that can be had for a couple of cents including shipping (arrow.com). Also note: potentiometers scratch, ring. You really want a capacitor to stabilize that input voltage if you're planning on turning that thing during usage. Yes, it's normal. It's not non-idealities per se, but the internal circuitry in this op-amp is incapable of providing a larger voltage swing. Not the answer you're looking for? Browse other questions tagged operational-amplifier transistors batteries dc comparator or ask your own question. Ideal OP-AMP - why isn't output voltage zero?